As official CFD software provider for ETNZ's hydrodynamic simulations, Numeca is proud to have been part of this impressive success story. 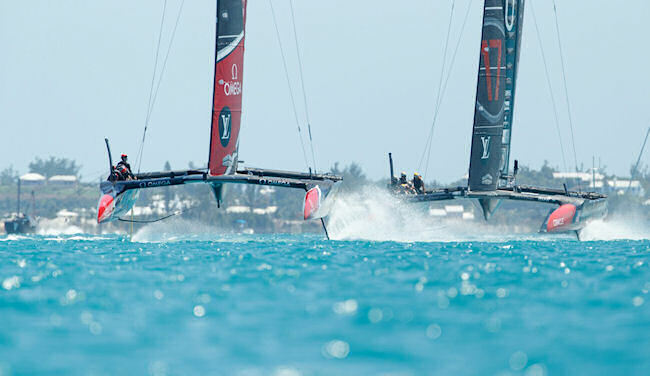 Having collaborated together in previous America's Cup challenges as well, we have witnessed an incredible evolution of technology, not in the least in the boat's hydrodynamics, where a multitude of various configurations have been simulated to reach continuous optimal ride height. Defender Oracle Team USA and Challenger Emirates Team New Zealand in the final stage of the 2017 America's Cup. For this edition of the America's Cup, among many other elements described in the 50-page design guidelines, the hull design had to be identical for all boats. This means that all attention for making a difference had to go to optimizing the appendages like the hydrofoils. The hydrofoils are the elements that boost the boats up, out of the waves, like an underwater wing, literally making them fly over the water. Since the hydrofoils play such a significant role in the race, it is important to be able to compare as many variances as possible in order to achieve the perfect balance between speed, stability and robustness. Dedicated solutions have been developed by NUMECA to create a fast, robust and accurate CFD RANS-based chain, capable of performing matrices of several hundreds of hydrofoil conditions in a few days in a totally reliable way! Because even the smallest possible change, makes a huge difference in a race like this. NUMECA International is a leading developer and provider of application-driven & multi-physics CFD and MDO software systems including Grid Generation, powerful CFD Solvers, Visualization, Uncertainty Quantification and Optimization, Aero- and Vibro-Acoustics suites, for the design, simulation and optimization of industrial products and processes. NUMECA is recognised worldwide as the most innovative CFD company in the fields of turbomachinery, marine, aeronautics, aerospace, automotive, and multi-physics. NUMECA provides world’s leading designers and manufacturers advanced technologies and models in response to their specific industrial requirements in fluids, acoustics, thermal or coupled physics applications. Customer satisfaction is our main objective, and we continuously improve our software and services to turn your product design into a real success for your organization. To learn more, visit www.numeca.com.